MetaStock R/T is specifically designed for real-time traders—traders who use intra-day data to transact in real-time throughout the trading day. (If you are interested in end-of-day trading, check out MetaStock D/C). 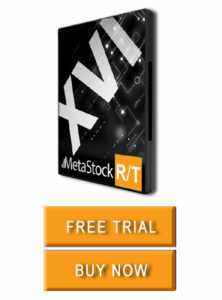 MetaStock R/T is powered by MetaStock XENITH and is among the world’s more powerful private trader platforms. Highly customizable, MetaStock R/T contains powerful analysis tools to help you make informed decisions about what to buy and sell and when to execute to be as profitable as possible. the Enhanced System Tester – you can create, back-test, compare, and perfect your strategies before you risk any of your money in the markets. the Indicator Builder – you can write your own indicators to develop different ideas or use any of the 150 line studies and indicators included. Whether you’re an experienced, active trader or just learning how to trade the markets, MetaStock helps you succeed. It contains powerful analysis tools so you can make informed decisions about what to buy and sell, and when to execute… resulting in the most profitable trades. MetaStock comes with many out-of-the box trading solutions that are reliable and easy to use. If you want to take your analysis to the next level, MetaStock gives you the ability to customize these solutions to your particular trading style. Listen to what the experts say about MetaStock. You can read some FAQs here. Read more on the features available and general information about MetaStock, or purchase / register for a free trial. Learn how to use MetaStock to it's full potential by signing up for our free newsletter and get a bonus eBook for free.